~Did your defibrillator have batteries in it? After too many years of the Packers being eliminated in January playoff heartbreaks, especially overtime, it appeared that there might be another painful exit Sunday night in Dallas. But Mason Crosby to the rescue, with a big assist to Aaron Rodgers and Jared Cook. The winning moment… 51 yards! Rodgers and the offense were on fire for the whole first half, a complete reversal from the first half of the Giants game last week. In fact, it took a blatant hold by Dallas cornerback Morris Claiborne on Davante Adams to stop the Packers finally. True, that’s supposed to be holding but not according to today’s officials, who let that guy grab Adams’ shoulder all night long. The Packers almost blew another big lead in a playoff game on the road, this time an 18-point lead. But Rodgers did what he so often does: lead the Packers to a victory in the final minutes. Where you at Skippy Bayless? On third-and-20, the Packers got 36 yards thanks to a great throw and brilliant catch by unrestricted free agent addition tight end Jared Cook on the sideline. That set up a 51-yard field goal for Mason Crosby for the win, which he drilled after being iced by Cowboys coach Jason Garrett just as he kicked it through a first time. 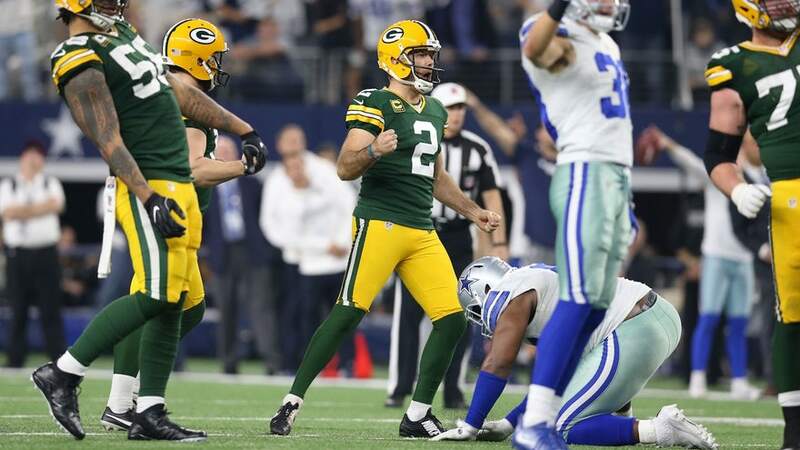 Before Crosby’s game-winner, the Cowboys and Packers traded field goals. With 1:38 to play, Crosby drilled a clutch 56-yarder to give the Packers a three-point lead, and possible win. But with the Packers defense, you suspected it wouldn’t be the game-winner. Rookie QB Dak Prescott and the Cowboys answered with drive and a field goal of their own — another clutch long one, a 52-yarder by Dan Bailey to tie the game with 44 seconds left. That left Rodgers too much time, although it wasn’t as easy as you might suspect. This Instant Classic might not erase the scars Packer Nation still has from two years ago in Seattle, when a Super Bowl berth slipped through Brandon Bostick’s hands. But this is a new chapter, and the script is still being written. The next masterpiece takes place next Sunday afternoon in Atlanta. Stay tuned to see what Rodgers has to author.